The Tripoli demonstration yesterday against the war on Tripoli, Khalifa Hafter and his foreign state supporters (Photo: Social Media). 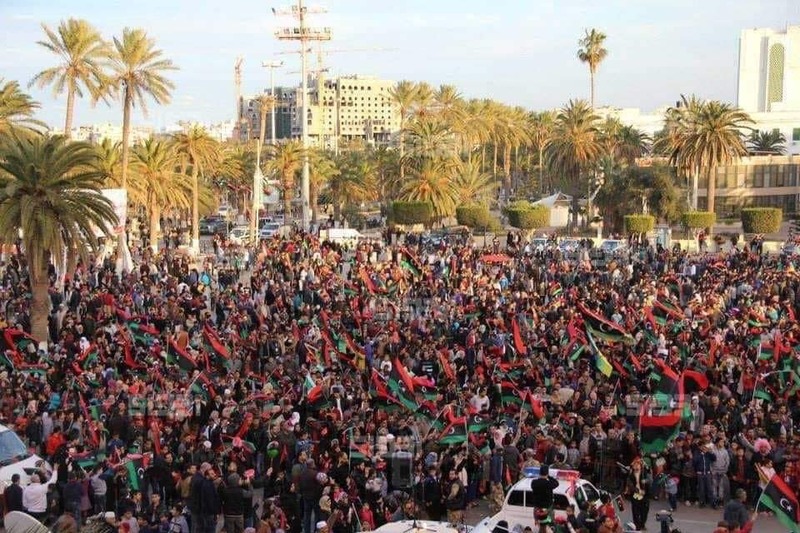 Thousands of Libyans came out to demonstrate in Tripoli and Misrata yesterday afternoon against the war on Tripoli waged by Khalifa Hafter, his Libyan National Army (LNA) and their allied forces. The demonstrations formed of people from all ages and walks of life objected to the war and Hafter himself, calling for a civilian state and objecting to possible military rule. The demonstration was sanctioned by the Serraj Ministry of Interior since all demonstrations need prior state approval. There were a variety of placards not only denouncing Hafter but also his French, UAE and Saudi backers. At the Misrata demonstration a French flag was burnt. The demonstration took place as the capital sought to unit and show solidarity sending Hafter a message that war on Tripoli was not the solution. Meanwhile sporadic and cat-and-mouse fighting continued in the outskirts of Tripoli, mainly parts of Swani, Ain Zara and Wadi Rabea with both sides claiming unverified advances in the front. There are also unverified reports of air raids by both parties. It is also notable that the Faiez Serraj official military spokesperson has failed to continue to provide a daily update of the battle through his press conferences, leaving an information vacuum and leaving the reporting to the unofficial ‘‘Wadi Doum 2’’, Volcano of Rage (Anger) and the Tripoli Protection Force militia Facebook pages to fill the void. On the other hand, The LNA spokesperson Ahmed Mesmari and the LNA’s War Information Division have continued to provide their side’s updates too, but again verification of their claims has been difficult to achieve. The Pro-Hafter and eastern-based Military Attorney General issued arrest warrants for 23 western based people, 9 civilian and 14 military/militia leaders, for ”supporting terrorism”. The civilians included all the Presidency Council members led by Serraj and Ahmed Maetig with the addition of former High State Council head Abdelrahman Swehli and Tripoli Central Bank of Libya Governor Saddek El-Kaber. Meanwhile, on the humanitarian front, the World Health Organization reported on Thursday that as clashes around Tripoli continued and the number of wounded rose to the hundreds, it reacted swiftly to provide field hospitals and ambulances with critically-needed life-saving supplies. WHO reported that heavy shelling and gunfire over the past 6 days has wounded 266 people and killed 56, including an ambulance driver and 2 medical doctors. Thousands of people have fled their homes, while others are trapped in conflict areas. Hospitals inside and outside the city are receiving daily casualties. It complained that the work of ambulance and hospital teams is being hampered by continuous shelling and armed clashes, including around heavily populated residential areas. Emergency teams face fuel shortages and migrants, who have been moved from detention centres, may not be receiving the medical care they need. “We have sent emergency medical teams to help frontline hospitals cope with caseloads and to support surgical staff in collaboration with the Ministry of Health,” said Dr Syed Jaffar Hussain, WHO Representative in Libya. “We also plan to deploy additional emergency teams and supplies to support first-line responders and have activated 3 sets of contingency stocks, which were pre-positioned in strategic sites before the fighting began,” he added.